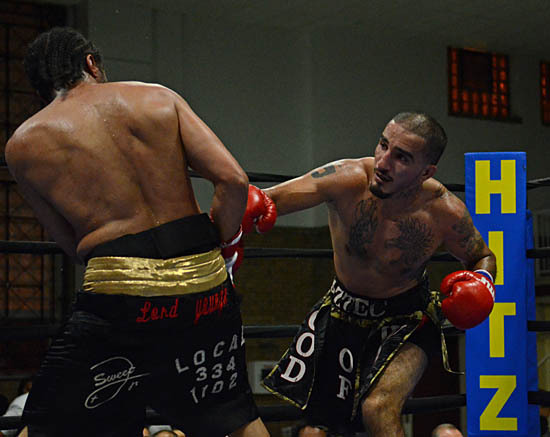 Donovan George Stops Maxell Taylor, Wins Vacant USBA Crown! Donovan George celebrates his win as referee Genaro Rodriguez intervenes. 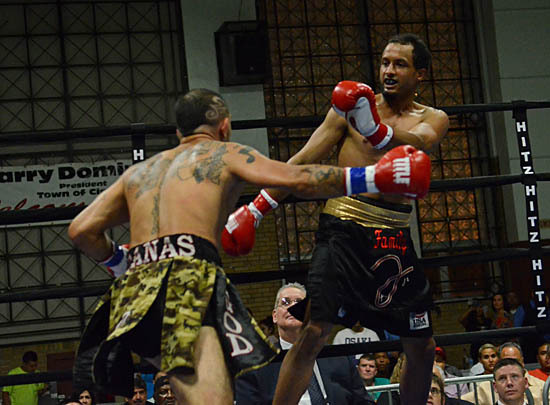 CHICAGO, April 1, 2011 – Several thousand at the UIC Pavilion erupted in cheers when hometown boxer, Donovan “Da Bomb” George, was introduced by tuxedoed ring announcer Thomas Treiber. Thirty minutes later, the fight throng roared as a new champion was born. Across the ring stood Maxell “The General” Taylor, a rugged, ebony hued fighter with an elongated, triangular beard and a long suffering expression of a hardened man aged beyond his years, who wasn’t impressed by some young upstart slugger. At 166.5 lbs. and a record of 15-2-1 and 6 knockouts, he’d never failed to go the distance.